The Int’l Raoul Wallenberg Foundation ups financial reward for information on man who rescued 1000s of Jews during Holocaust. PHOTO: Reuters. The U.S. 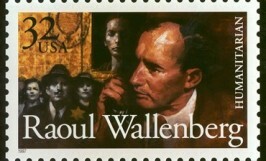 Postal Service issued April 24 a stamp commemoration World War II hero Raoul Wallenberg. The stamp was unveiled at the U.S. Holocaust Memorial Museum in honor of the Swedish diplomat who helped save tens of thousands of Jews from Nazi death camps, primarily by issuing safe passes and creating safe houses. The International Raoul Wallenberg Foundation has increased it financial reward for information leading to the whereabouts of Raoul Wallenberg, who rescued thousands of Jews during the Holocaust, and his chauffeur, Vilmos Langfelder. Speaking from Tel Aviv via telephone with The Jerusalem Post on Sunday, Danny Rainer, the head of the Jerusalem office of the foundation, said it increased its reward from 100,000 euros (about $123,000) to $500,000 because anonymous donors contributed new funds. The foundation announced the 100,000 euro reward two months ago in Moscow, he said. The new push to gain information on the Swedish diplomat and his driver coincides with the 100th anniversary of Wallenberg’s birth on August 4. Rainer said the foundation seeks to “preserve the research and legacy of Wallenberg,” and of gentiles and Jews who risked their lives during the Shoah to save Jews. Last week, Baruch Tenembaum and Eduardo Eurnekian, founder and chairman of the International Raoul Wallenberg Foundation, respectively, met with Secretary General Ban Ki-moon and with Ambassador Jan Eliasson, UN deputy secretary-general, at UN headquarters in New York. They discussed the increased award amount with Eliasson. Tenembaum is an Argentinean-Jewish businessman and Eurnekian is an Argentinean-Armenian businessman. Raoul Wallenberg saved thousands of lives in Budapest during the Holocaust, including that of Tom Lantos, who later became a US congressman, and co-founded the foundation. Soviet forces arrested Wallenberg and Langfelder on January 17, 1945. Their ultimate fate is still unknown. Rainer told the Post, “We have been corresponding with Russian authorities over the years. It is “very unlikely that the Soviets killed Wallenberg without records,” he said. Rainer said the Russians were still not allowing “unrestricted access” to their intelligence files regarding Wallenberg.